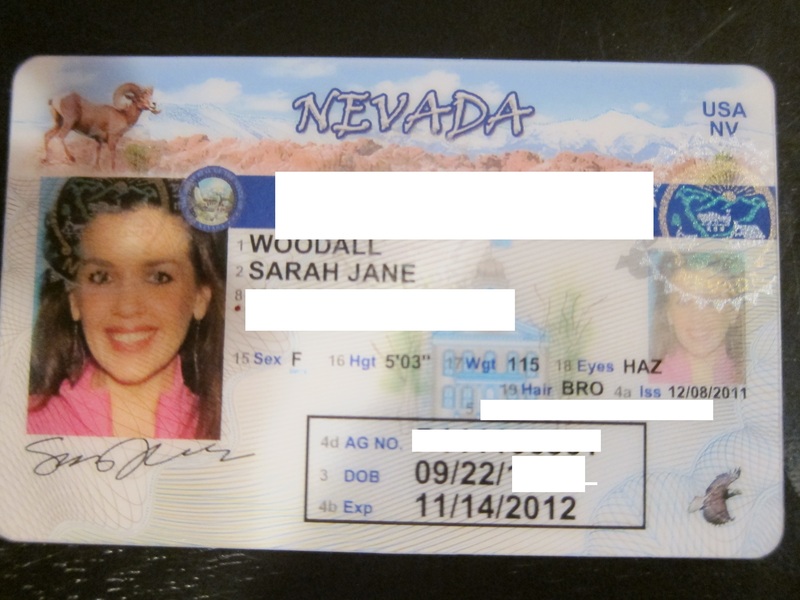 A NV medical marijuana card looks just like a driver’s license. Not sure why I blacked out the “MEDICAL MARIJUANA PATIENT” header. Also, child services or whatever might have something to say about you using your meds around your kids…I haven’t heard of anyone being hassled over that, but it might be an issue for any of you parents out there. Additionally, anyone with a commercial driver’s license in ineligible, as is anyone with a prior drug conviction. Also keep in mind that the way you can use your medicine will be strictly regulated; you can only use it at home, basically. You can’t transport it across state lines, so forget about using your meds while traveling. And you’re not allowed to use in public — like at parties, concerts, etc. It’s medicine, fool! You can still get a ticket for using it recreationally. Finally, be advised that it’s kinda hard to get medicine in Vegas; the dispensaries were all shut down due to their existing in a sort of legal limbo, and until the lawmakers get that straightened out, the only way to get your meds is to grow it yourself (you can grow seven plants with a MMJ card, 3 of which can be mature at one time) or to order it from a delivery service. The delivery service is convenient, but they tack on a $5 delivery fee plus tip to the already high prices: expect to pay around $50-$60 for 1/8oz. (plus tip/fees). *NOTE: this is all supposedly changing in 2014…they finally passed a bill to allow dispensaries to operate…so we’ll see how that goes. After considering all that, if you still feel it’s worth it to have a card (as I do…I LOVE being able to tout my potsmoking to the world), then here’s how you go about it. Once you’ve figured that out, go ahead and order an application from the Nevada Division of Public and Behavioral Health. You just need to write them a letter explaining your interest in obtaining a medical card application, and enclose a check or money order in the amount of $50 to submit with your request. In other words…it costs $50 just to get the freakin’ application. They say you’ll get your application packet in 14-21 days. I’m pretty sure it took less than a month to get mine, so I guess they’re not lying. Once you get it in the mail, you’ll find it’s a packet of various forms that need filling out, each of which will cost you more money. You have to be fingerprinted, which depending on where you go costs around $20-$25. You need a physician’s recommendation. I have been using the office of Kathleen Smith at Ultimate U Medical; she’s a legit doctor who charges about $100 for an office visit. I have also used the services of Dr. Reefer; they are under new management, and have nothing to do with the original guy (who was way ahead of his time, and ran into legal trouble). Dr. Reefer’s office will, in fact, take care of the whole application process for you, from start to finish, for a very small premium — including fingerprinting, notarizing, and filing. Lastly, you need to have two forms notarized, which is usually around $5 per form. Now you have to wait. It can take quite some time for the state to approve your application…I think it took them a couple months for my first one. If they deny you, you’re out the initial $185 (what you spent on the app, doctor, etc)…but in my experience I don’t think they deny many people. As long as you don’t hold a Commercial Driver’s License or have any drug convictions, you’ll probably be OK.
Once you finally do receive your letter of approval, now you have to go to the DMV to get your actual card. But don’t worry!!! You have a medical condition — they give you a handicap pass, and you get to go to the front of the line 🙂 Damn straight, after paying all that cash!!! Total cost of card: $50 application + $100 doctor’s visit + $10 notary fees + $25 fingerprint services + $150 state fee + $12 DMV fee = $347. That $347 is only for one year. When your card expires, you have to do it all over again, except the initial application fee and the fingerprinting. So you’re looking at around $280/year just to stay legal. For that $280, you have the privilege of paying $60 for 1/8oz. of delivery-service weed…or of growing your own medicine, 3 plants at a time. Either way, I ask myself every year if it’s really worth it. For me personally it probably isn’t — I have lots of friends who sell pot, and I could buy it from them for cheaper anyway. And because I mostly use my meds at home, in bed, I’m not really at risk of getting busted. I can’t take it with me when traveling, anyway….so really, what’s the point?! At one time, I felt that by getting my card and advertising my status as a medical patient, I was helping make the idea of medical marijuana more commonplace and acceptable…and hopefully paving the way for the eventual legalization of pot smoking in NV. But now, I feel like the only thing I’m really doing by getting a card is lining the state’s pockets. Fuckers! Anyway, keep all this in mind…and good luck! This entry was posted in Uncategorized and tagged how to get a medical marijuana card in nevada, medical marijuana nevada, nevada marijuana card, nevada medical card, nevada pot card, Obtaining a Medical Marijuana Card in Nevada. Bookmark the permalink. Wonderhussy, you’re a cute little piece of cheese, don’t fool around with marijuana! You know, California is now requiring cancer warnings on coffee and the health authorities say you have to drink about 60 gallons per day for several years to be at risk. I guarantee you, marijuana has far more health risks than coffee and probably tobacco. Marijuana grows wild all over the world whereas tobacco has been carefully cultivated for hundreds of years. Marijuana is extremely high in fiber. They make rope out of it. There is so much poison and trash in marijuana smoke it’s ridiculous and it reeks havoc on your brain and lungs. I know you don’t want to hear this but I am 80 years old and I’m sure I would be very sick or dead by now if I was a marijuana smoker. Well, I know opinions are like assholes, everybody has one. Ok, there’s mine. Just be careful Wonderhussy. I enjoy your UTUBE clips but I see you take chances like walking out on top of that old mill structure. I’ve taken a lot of risks so I can’t say too much. I still ride my Harley which is something I’ve been doing for about 50 years now and friends tell me maybe I’m too old now but I won’t stop doing what I enjoy. Keep making videos, I’m hooked on them. Have fun while you’re young Wonderhussy just remember the immortal words of that well known and highly respected American Philosopher W.C. Fields, “there’s marauders behind every bush!” and be careful. Hey, you did a video on a ship out there, if you ever get to the east coast, do a video aboard my old ship the USS Intrepid. I don’t want to keep bugging you Wonderhussy but in your travels, did you ever make the acquaintance of Annette Carrion? She was just 33 years old, a beautiful model, she had a website with Instagram, and she was a motorcycle enthusiast and co-founder of a woman’s MC group. She lived and operated around in your stomping grounds out there. Anyway. sadly, she was killed on a very dangerous road that she was very familiar with east of LA somewhere on April 2. It kind of ties in with what I was saying abut “have fun but be careful.” Here’s an article about it. Oh no, I’ve never heard of her. So sad!